I made the worksheets on this page using a font that has similar style to letters of a particular handwriting program that I can't name because it is trademarked. It's nicknamed HWT or HWoT among those who talk about the program online. While I am grouping these worksheets as "K-1" please also refer to the rule height when choosing which worksheets to use. 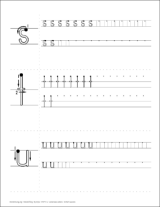 The handwriting worksheets on this page will have a rule height of approximately 5/8 inch. In most cases, the uppercase letters are grouped according to stroke. The worksheet prints in portrait and there are two lessons per printed page. 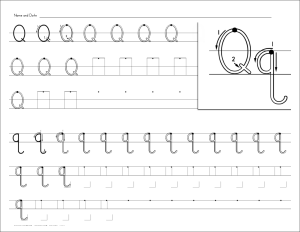 Pictured below is the layout of Basic Letter Practice. Each file features one letter and the placement of every letter is guided to a certain degree. Each worksheet could be completed in one sitting or in two sittings. In 3 Short Lessons each printable contains at least three letters and each letter may be completed in one lesson. The student will practice writing each letter on two lines. Letter placement is guided to a certain degree. The animation pictured here is cut and smaller than the actual animations. Each animation features both the uppercase and the lowercase of one letter.